"You don't want to be in love... you want to be in love in a movie." Romantic comedy, aka "rom-com", is a genre in which the development of a romance leads to comic situations. Since all it says on the tin is "love" and "laughs", the genre provides large meadows for the screenwriters to frolic in. Many writers have pushed and blurred the lines of romantic comedy. 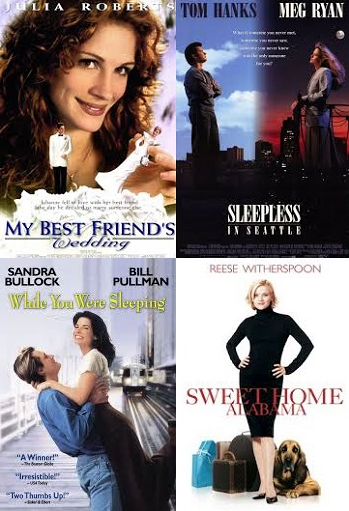 Many rom-coms use a set of certain tropes. Many feature two more or less equal protagonists with one slightly more equal than the other. The story may start with one character being dumped/divornced/widowed. His/her friends and family urge him/her to find someone. The protagonist may agree to go on several blind dates. At some point, they meet our second protagonist. Usually, the second character isn't an obvious match for the first; maybe she's wild and crazy and he's a CPA. Or he's rich and she's poor. A romantic comedy usually provides a victory of love against all odds. A certain amount of overlap with Dramedy is not unusual. Romantic comedies in more recent years have made a concerted effort to subvert some parts of the genre where possible, present the story in a more down to earth or certainly less light and fluffy manner, add raunchier humor, more flawed characters and occasionally elements of self-deprecation, but in most of them there remains a large degree of audience-understood foregone conclusion. Every story needs a conflict, and since rom-coms are driven by the quest for love, the conflict derives from the obstacles to the quest. This could be the apparent incompatibility of the leads: mutual Love at First Sight is rare. The two characters will spend a good part of the movie fighting their obvious attraction. Eventually, they'll realize they're perfect for each other. Or, something will pop up; maybe a Three's Company kind of misunderstanding, or a revelation in the third act about one of them lying. One of the two characters will storm off in a huff. Or the couple is already married for some reason, and the conflict comes partially from different expectations and misunderstandings. The climax of a rom-com requires the satisfactory recognition of love: the other chases after the love interest and does something really romantic to win them back. The reconciliation scene ends with the two characters reunited in a romantic embrace. Often ends in a wedding. The usual rom-com main characters are covered in Love Interests. It is becoming increasingly common for one or both protagonists to be Adorkable. Characters that often occupy the stratosphere around the rom-com protagonists include: Beta Couple, Deadpan Snarker, Pet Homosexual, Plucky Comic Relief. The main characters are typically employed in a Rom Com Job. See also Romance Arc, Rule of Romantic, and compare with the Bromantic Comedy. Films of the Screwball Comedy sub-genre of the 1930s-1940s were often these. His Girl Friday adds a curve in that the romantic protagonists are divorced as well as former boss and prize employee (editor and ace reporter). A similar situation is found in the '50s musical comedy Kiss Me Kate, where the divorced protagonists falling back in love are, respectively, the director and leading lady in a modern adaptation of an earlier example of the Romantic Comedy genre, Shakespeare's The Taming of the Shrew. 1981's Arthur was an intentional throwback to these, and a very successful one. 1972's What's Up, Doc? was an earlier one. 1951's Singin' in the Rain is an even earlier throwback, also very successful. Leatherheads was also a throwback. Except it didn't work too well. The Runaway Bride strays deep into screwball territory, although it is more serious in some respects than most - the protagonists' psychological hang-ups are explored and e. g. the father's drinking problem is not done for laughs. Miss Pettigrew Lives for a Day is a modern incarnation, but the threat of war on the horizon casts a shadow over all the gaiety. There are quite a few young adult books that follow this formula, Sarah Dessen's work being a good example. They usually are exactly like the countless movies in this genre, except that they take place in high school. Most of the common stereotypes of rom coms are translated into a high school setting, for example instead of them being not compatible the couple usually will be childhood friends, and usually the girl wants the most popular guy, but realizes she's in love with her best friend. Every bleeding Kevin James vehicle save Grown Ups. Some of Woody Allen's films, most famously Annie Hall. He's more prone to the Bittersweet Ending than most. (500) Days of Summer is a deconstruction of the genre. Amélie has many elements of the romantic comedy; probably it's not considered so by most people because it's so original in terms of not only its story but also its art direction and acting that it's hard to associate it with the romcom's reputation of formula. Anastasia might not be a Romantic Comedy exactly but it does have Meg Ryan voicing the lead who has a typically sparky Rom Com like relationship with the love interest Dimitri (John Cusack). Possibly the closest analogue in animation to this genre, though romantic subplots in contemporary Western animation often invoke its tropes (consider the Shrek films). The Apartment is at once a subversion and a straight example of this. The Break-Up is a rom-com with a difference: its Bittersweet Ending. Doki Doki Literature Club!, though the story goes through an abrupt genre shift to psychological horror partway through. Down with Love is a parody. Drinking Buddies is a rare example that examines the difficulties when you're already in a relationship, rather than simply capturing the beginning of one. Eternal Sunshine of the Spotless Mind is a deconstruction of the genre. Forgetting Sarah Marshall At least one review for this movie referred to it as a "romantic comedy for guys". Groovy, Kinda Is a webcomic that follows Larry Pye, his girlfriend Edison Lighthouse, and Anya Langerak as they try to make a three way relationship work. Haiyore! Nyarko-san is "love(craft) comedy that 'boy meets a devil'". Yeah, a parody of Cthulhu Mythos. How to Lose a Guy in 10 Days: With Kate Hudson and Matthew McConaughey, how could it go wrong? I Love You Phillip Morris is a gay-romantic dramedy. In The Good Old Summertime - The Shop Around the Corner re-imagined as a musical. It Should Happen to You - Jack Lemmon's first feature-film, and Judy Holliday in a great Dumb Blonde role. I Want Someone To Eat Cheese With: A bit of a twist on it as the point is that the guy does not get the girl. I.Q. - Meg Ryan again, as Albert Einstein's (probably historically inaccurate) niece, with Tim Robbins as an auto mechanic who winds up with Uncle Albert (hilariously played by Walter Matthau) and his buddies trying to help him get her away from her stuffy psychologist fiance (played by Stephen Fry). The Fanfic Knowledge Is Power is theoretically this . Kotoura-san: A surprisingly dark one. The romance and comedy is mixed with substantial amounts of drama. The Downer Beginning is the first bump in the road. Love Actually: Multiple love stories going on around Christmastime in London. Stars Hugh Grant, Alan Rickman, Emma Thompson, Liam Neeson, Bill Nighy, and some other people. Slightly unique in that a few of the couples didn't get together. Maid in Manhattan with Jennifer Lopez— is "Cinderella"-derived; she's poor, he's rich, obviously. The Major and the Minor Starring Ginger Rogers and Ray Milland. Billy Wilder's directorial debut. Manhattan Love Story is a Romantic Comedy TV series. Make-Out with Violence is absolutely heartwarming. Morning Glory - It's mostly a comedy about Rachel McAdams working as the producer of a morning show, but it still gets categorized as a chick flick. Like IQ, it's story is bigger than just the romance. Much Ado About Nothing: Old school Romantic Comedy. As is A Midsummer Night's Dream and several other William Shakespeare plays. Kenneth Branagh's version of Love's Labour's Lost, which cross-breeds the original text with the songs and style of 1930s movie musicals. Much Ado About Nothing (1993): 1993 film adaptation of the play. Much Ado About Nothing (2012): 2012 film adaptation of the play. My Blue Heaven: The subplot of this movie has Barney Coopersmith and Hannah Stubbs, an FBI agent and a police officer respectively meet with Belligerent Sexual Tension, and as the movie progresses, they fall in love. He even spends the night at her house and throws out her ex-husband the next morning. Out At The Wedding is a rom-com about a woman who pays a lesbian to act as her fiancee when she gets caught up in a white lie involving her family. Parting Glances - a gay film set in New York during the height of the AIDS crisis. Notable for not killing off any of its characters and for being Steve Buscemis feature film debut. Jane Austen's Pride and Prejudice, where Elizabeth Bennett and Mr. Darcy start out acting contemptuously toward one another. Given the conventions of Romantic comedy, isn't the ultimate outcome of their relationship inevitable? Return to Me: David Duchovny plays Bob, an architect whose wife dies in a car crash. Minnie Driver plays Grace, who has a heart transplant early on. About a year later, Grace is waiting tables at her grandfather's restaurant when Bob shows up on an abysmal blind date. Bob and Grace click and all seems to be going well, until Grace finds out just who her heart donor was... Carroll O'Connor (yes, a.k.a. Archie Bunker) gives a solid supporting performance in his final role, playing Grace's kindly grandfather, who proves quite helpful to both parties. Serendipity. It was in fact marketed with this tag line: "Destiny with a sense of humor." Sleepless in Seattle - Tom Hanks and Meg Ryan. A kid calls a radio talk show looking for someone to date his widowed dad and a woman on the other side of the country tunes in. She gradually becomes Genre Savvy and finally meets him at the end of the film. Smiles of a Summer Night says right after the title: "en romantisk komedi av INGMAR BERGMAN. "note "a romantic comedy by INGMAR BERGMAN." Yes, that Ingmar Bergman. Think Like a Man: The surprisingly well acted story in which Steve Harvey releases a book telling women how men think, women read, and men react. The Ugly Truth: Stars Gerard Butler as a foul-mouthed, sexist TV personality and Katherine Heigl as his producer. The Wedding Singer: One of Adam Sandler's most critically acclaimed movies. When Harry Met Sally... was far from the first Romantic Comedy; it was filmed in 1989. But it has wit and humor and a nice soul, and as such is generally regarded as the model for the genre. Plus, it features Meg Ryan before she paid a surgeon to take The Hammer of Hephaestus to her face, so that's nice. Billy Crystal was good in this, too. You've Got Mail - Tom Hanks and Meg Ryan again. This time she runs a small bookshop, he's one of the owner/execs of a big bookstore chain threatening Meg's store, and while they're hostile in real life, they're close friends online. A remake of a the Jimmy Stewart movie, The Shop Around the Corner (1940). Why Be Good? is a silent film from 1929 that has many elements that would later be associated with Romantic Comedies. Misunderstandings galore!